Whether you want to play classical, rock or country style, the learning process is customized for you! Beginner students can expect to work on simple songs, melodies, sight reading and theory. Your teacher will balance musicianship and fun by making sure that at each lesson you are challenged with a new technical or theory concept, but will always end with something fun such as your favorite song. -Your child is uncertain about the instrument he or she wants to play. ​Less expensive instruments sold on websites like eBay are generally lesser-quality instruments that can be extremely frustrating to play upon. I will be happy to recommend a few quality violin rental stores, or provide the instrument upon request. WHAT WILL I LEARN DURING MY VIOLIN LESSONS? ​ARE YOUR VIOLIN INSTRUCTORS QUALIFIED? 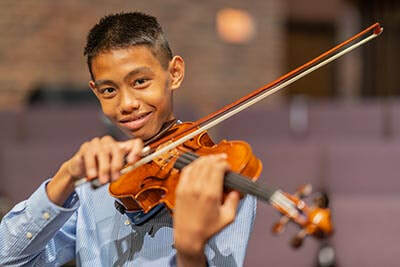 Our violin teachers have received their education from respectable institutions in the US such as Roosevelt University, De Paul University, Columbia College of Music, Judson University, University of Minnesota, and also in universities across the world. Some of our instructors have gone on performance tours of the US and Europe, all which have many years of professional performance and teaching experience. In addition to their teaching credentials, our teachers have warm personalities, are extremely friendly and strive to get to know each student and their parent on a personal level.